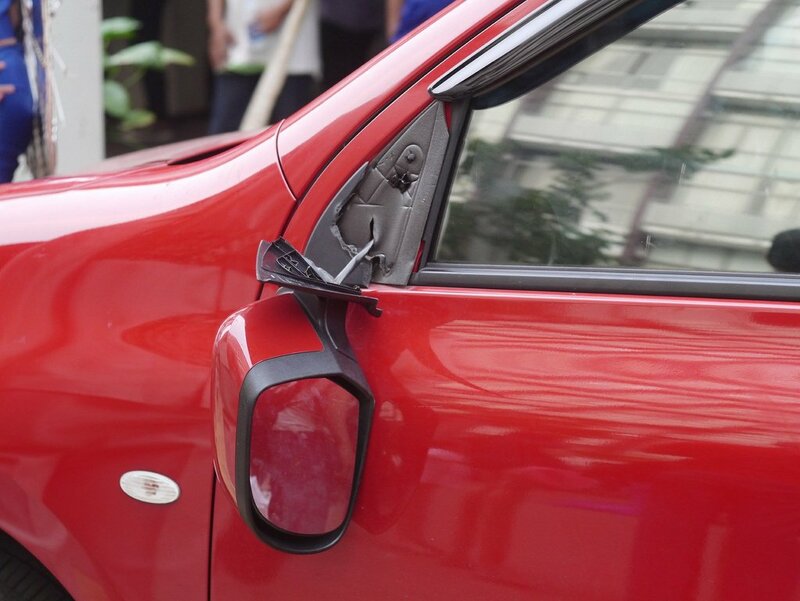 When Should You Have Side Mirror Replacement Done? What Is Done during Side Mirror Replacement? One of the more commonly damaged car parts is the side mirror. You drive too close to a parked vehicle or don’t quite miss a speeding vehicle and your mirror is likely the part to get smashed up. Side mirror replacement costs between $139 and $328 for parts and labor, while you can expect to pay between $35 and $90 for the part itself. While you can find third party mirrors for lower prices than official manufacturer parts, that isn’t usually what your dealership is going to use. The cost of the part will vary depending on the type of mirror your vehicle’s manufacturer uses. It doesn’t take long to replace a mirror, but some vehicles will require that part of the door be taken apart to install the mirror. Below are a list of sample costs from the leading garage chains in the USA. Expect the price you pay to be different depending on where you live and what kind of car you drive. It may seem like a small part of the car, but there are a lot of components that go into making your mirror look great on your vehicle and functional as well. You may end up paying far more than you expected when it comes time to replace it or you may find a way to save a lot of money and get basically the same results. Here at Auto Service Costs we will help you do both. The price will greatly vary for side mirror replacement. The extent of the damage is a big factor as is the kind of vehicle you have. You also have to figure the kind of mirror you have into your estimates. Manual and automatic mirrors are not going to be same price. Once again, the extent of the damage is going to factor in here. If more than just the mirror itself was damaged, then you will have to pay even more than we’ve covered here. It can be difficult to function without a side mirror. It tells you when vehicles are coming up on you and when it is safe to change lanes. It is essential to have that mirror there for safety. You are going to be partially blind on the road until you get it fixed. It may also be illegal to drive without a functioning side mirror in many states, so you will want to replace it as soon as possible. If you can’t fix the mirror professionally immediately, then you can probably fasten it on with some duct tape. If the mirror is completely shattered, you can fasten a small hand mirror on your vehicle until repairs are made. Any way you do it, just make sure that you have a side mirror on your vehicle. It’s going to be unsafe to drive without it. You need to have the mirror replaced right away once it is seriously damaged. Not all side mirror damage necessitates a replacement though. A scratch or crack here or there does not mean you need to replace your mirror. But if you cannot see out of it clearly and accurately, then you need to get it replaced right away. When doing basic repairs or maintenance on your vehicle, your mechanic may notice that your mirror is started to wear out, or more specifically that its connection to the vehicle is starting to break down and deteriorate. It may not be an emergency to replace the mirror at that point, but you need to plan to replace it soon. Most side mirror replacement is pretty straightforward. The old mirror is taken off with a socket wrench or screwdriver and the new one is placed on the same way. Sometimes, the process is more complex. There may be wiring or cables to connect if the mirror is automatic. Some mirrors are integrated closely into the nearby components of the vehicle. In some models, a large portions of the same door needs to be taken apart to allow for proper installation. If you plan to do the mirror replacement on your own, make sure you know what you are getting yourself into before you commit to it. Many times, the mirror or parts of the car will need to be repainted. Odds are, if your mirror was damaged, your car was scratched up a bit and needs a small paint job. This can add to the cost of the replacement, but it should not be costly. Some special tools may be required for all this. A door handle removal tool will help get off the door handles and attach the new cable. A trim handle removal tool may be necessary for when you remove door panels. Often, just the panels of the door need to be removed to install the new mirror. The best way to save money on side mirror replacement is to buy the parts and install the mirror yourself. In many cases, you can save a lot of money and time. Some mirrors will need specific socket wrenches to get them off and others will require you take apart other components so the vehicle to install them properly. You can always research the installation process for your vehicle before you make your decision. You can almost always save money by buying your own parts though. Keep in mind that not all mechanics are going to allow you to bring in your own parts. Before you buy a new mirror for your vehicle, be sure that you are buying a suitable model and that your mechanic will permit you to use your own parts for his repairs. Other than that, just try to find the least expensive mechanic you can for the job. As long as they are using high quality parts, it shouldn’t matter who replaces the side mirror for you. It isn’t usually a complex job, so any mechanic should be able to take care of it easily for you. We’ve compiled some costs for having the side mirror replaced on a range of popular car models to help give you an idea of what you’ll pay for your car. There’s not a huge difference between the costs of this work for different cars, so the cost should be fairly consistent across all brands.